For many people, their pooch is more than just a pet, it’s a member of the family. After all, you live together, play together and you’re responsible for your dog’s health and diet too. Just like humans your pet’s diet plays an important role in their health. If they eat too much of the wrong things, then they can get very ill. When it comes to food, dogs will eat just about anything they can smell! This means you’re completely responsible for ensuring your pet pooch eats the right food that can keep him healthy. Unfortunately – and just like us humans – a bad diet can lead to serious illness, including gastric cancer. However, with just a little research, you can help avoid this and give your dog the best food to promote their health, provide them with plenty of energy and keep their coat shiny and strong. What Can Cause Canine Gastric Cancer? Just as in human diets, ingredients that include nitrates, nitrites and nitrosamines are among the key culprits when looking for causes of cancer. They are included by food manufacturers as part of the meat preservation process, as they help keep meat looking the way it should. But, if too much is used – or consumed – it comes at a cost to people and animal’s health. They’re not always easy to spot, but if you look at the ingredients in your dog food and see sodium nitrate or a number of food colorings, then that’s where those nitrosamines and nitrates will be lurking. Another dog food detail that falls in the cancer-causing box, is something called advanced glycation end products, or AGEs. This is something that occurs during dog food processing. Some dog food preparation methods, particularly for some dry kibble products, include a process where the dry heat and pressure creates a chemical reaction, resulting in AGEs in processed dog food. This is a much harder detail to discover in your brand of dog food. However, if you make some changes to your pet’s diet, then you should be able to drastically reduce the amount of AGE food products your canine is eating. Now, it’s important to say that not all dogs will develop gastric cancer from a diet high in nitrates and AGEs, but it is something you need to be aware of and to look out for. To help you monitor your dog’s health, here’s a list of symptoms associated with gastric cancer in dogs. Darker stools. If your dog’s stools change color and/or texture, then it can indicate a problem. Gastric cancer will give your dog a dark, tar-like stool. Monitor your dog for a few days and if the stools remain that way, you should seek advice. Diarrhoea. Constant loose stools are rarely a good sign. A diminished appetite, particularly if your dog is losing weight, too. A lack of energy. If your dog is less interested in playing with you, over a period of more than a few days, then, combined with other symptoms, this could be a sign of gastric cancer. One that’s pretty hard to spot is anemia. If your dog seems lethargic and uninterested, they could be anaemic. You can check this by looking at their gums. If their gums are pale it can indicate a low red blood cell count, which is the main symptom of anaemia. If your dog has just one of the above symptoms, then it’s probably nothing to worry about. However, if they have two of these symptoms or more, then you should definitely seek advice from your vet. The most common type is Lymphoma and accounts for 7% to 24% of gastric cancer in dogs. It’s also more common in male dogs. Adenocarcinoma is named because of the type of tumors caused by the cancer. This type of gastric cancer can be found in the glands. It begins in the stomach before growing on gastric lymph nodes, stomach fat and spreading to other intestines. Leiomyosarcoma is a type of cancer where the tumors grow on the walls of your dog’s organs, such as the stomach, spleen and kidneys. Mast cell tumors can be found in your dog’s digestive lining and also the lining of their lungs, nose and skin. These tumors stop your dog’s body from producing the right chemicals to help their body function properly. All of this sounds awful and we know most dog owners will do everything they can to help their dog avoid getting cancer. 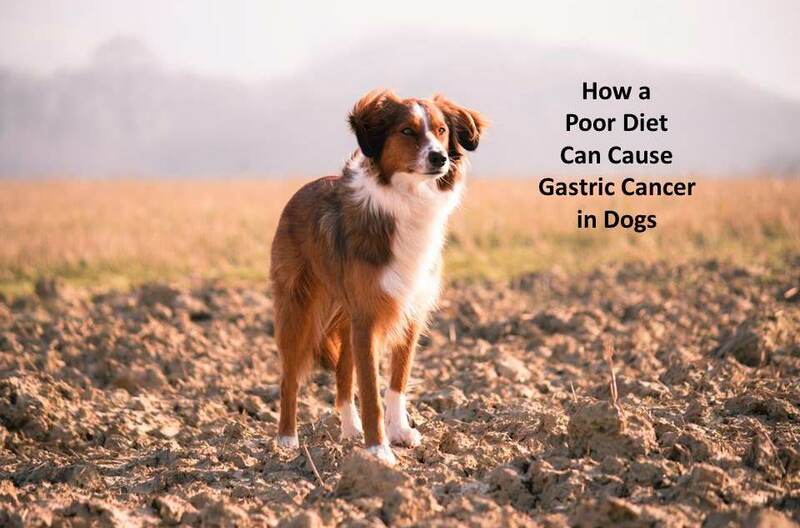 Luckily, just as the wrong diet can lead to gastric cancer in your canine pal, the right diet can help them avoid it. The best, healthy, non-carcinogenic diet for your pet, includes lots of unprocessed foods. Raw, meaty bones are a great treat, as is raw meat and fresh vegetables mixed into your pet’s regular dog food – that you consider to be safe. Many dog-owners also swear by home-made dog food that includes raw meat, steamed or juiced vegetables, pulp included and types of food that are easily digested by a dog. Fibre, both soluble and insoluble and essential fatty acids Omega-6 and Omega-3 from flax seed should also be part of a daily ritual. The grains that are often used as binders for mass-produced dog food, aren’t designed with dogs in mind and can also contribute to severe illness. Green tripe, raw eggs, bone broth, kefir, flax and coconut oil are all considered superfoods for dogs. And, they’re also natural products they can digest easily. If in doubt, think back to humans and cancer; too much processed food is linked with cancer, just like it is in dog. That means you should think carefully about your pet’s diet and ensure they’re getting the right foods to help keep them healthy.